IN A church in Romania in 1952 a nun commits suicide. Sensing something sinister the Vatican sends an exorcist and a young nun to investigate. The mysteries, however, are only just beginning. When the exorcist and the young nun (not really sure why she’s sent actually ) arrive in Romania, a young French-Canadian (wait, I thought we were in Romania? ) takes them to the church, a visually impressive building which looks like the famous Hohenzollern Castle in Germany, where they are told to wait for the night. You do not have to have seen any of the previous movies in this series, of which there are five - this is the sixth film in five years (usually a good sign ). This is a stand alone horror with some passing reference to the Conjuring universe. While I really enjoyed The Conjuring, around 10 minutes into The Conjuring 2 I got the feeling they had run out of good ideas. So here I am, five years later, movie six thinking, yes, they have definitely run out of good ideas. Sometimes I think they come up with the title of the movie and then figure out the story around that. They are usually genre films like Con Air or Manic Cop. In this situation, it is more likely they had the poster before they had plot. 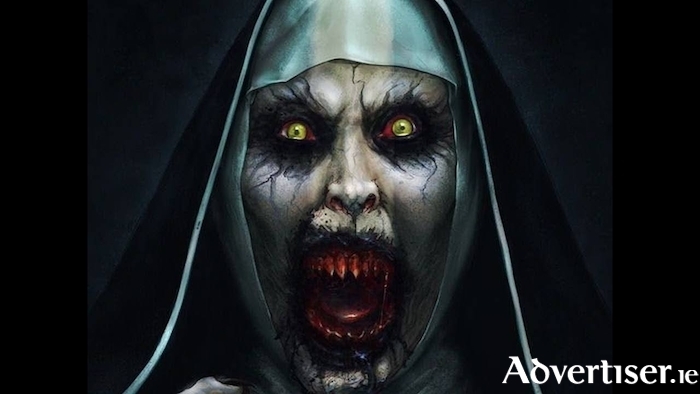 The creepy nun from The Conjuring is indeed a great image and the title The Nun is scary...especially depending on where you were educated. It is the kind of image you’d send to friends and say “Let’s go and see that!”. The problem is, the makers just went ahead with a lousy script, a stupid plot, and boring cast. How many times should you see this movie? Nun.